This companion tool allows you to generate encrypted passwords in bulk, to be used in conjunction with the /pe command line switch. The output can be piped or redirected to whatever you want. Please note that it has a builtin delay of 2 seconds after each password, to prevent it from being used for a brute force ‘reverse engineering’ of passwords. This shouldn’t be a problem for normal scripted use however. Starting with version 1.4, you can now also generate the password in the .rdp file hash format instead of the default encrypted format by using the option /hash. You could use this option to generate your own .rdp file for example. Please keep in mind however that – unlike with the encrypted password – the generated hash password only works for the user which ran the command and only on the computer it was generated on. 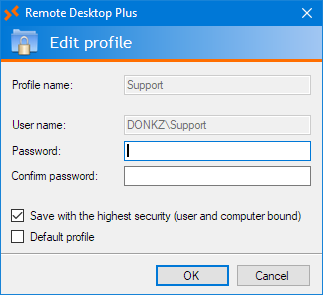 You can use the companion tool RDPProfile to create Remote Desktop Plus profiles from the command line. This can be useful if you want to pre-populate some profiles for your end-users. /profile:profilename The name of the profile to create or modify. /p:password For automatic logon, specify the password for the user. /pe:encrypted_password Specifies an encrypted password for enhanced security. /global Save the profile using less strict security (for roaming use). /default Set the profile as the default profile. /-y Do not overwrite the profile if it already exists.